Manufactured in Allemagne from 1974 until 0. Since 1938, year during which was launched the production of Minox Riga (because manufactured to Lithuania), the firm of Walter Zapp always made in the miniature. It was normal that in the appearance of format 110, Minox was interested in this small size. In 1974, Minox thus manufactured the 110 S, but contrary to the majority of the manufacturers who used this format for simplistic cameras, the mark was going to make of it a camera of very good quality. However, more than twenty years after, the German site of Minox does not mention this camera as if it were about a spot in the history of the mark. I however find that there is to hardly redden of this descent. The body of the camera is made of a solid plastic and very beautiful aspect, near to that used for the series of Minox 35. The lens is a f2.8/25 mm. The camera using starts with the aperture of a double panel, which in addition to its function of protection of the lens, the cell and the rangefinder, has also a function of sun visor. Winding is possible thanks to the lever which is in front of (?) the camera. 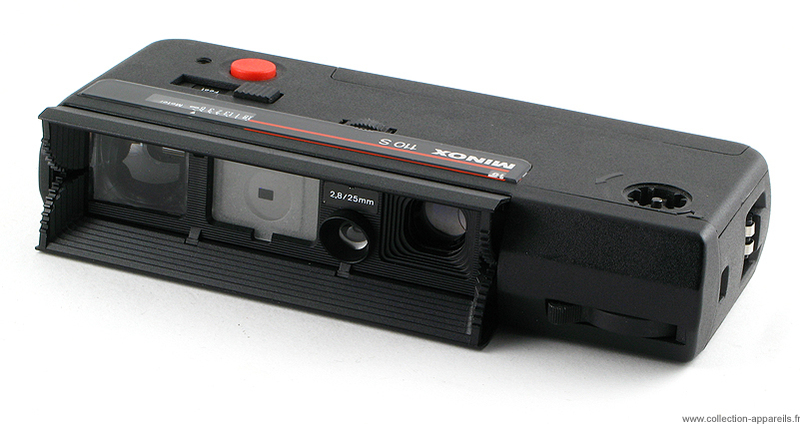 In 1976, the camera was supplemented of an electronic flash, F110, whose powering was automatically coupled with the posting of the Flash symbol on the body. The setting of the exposure is then automatically coupled with the telemetric setting of the distance, as with the flashcubes.